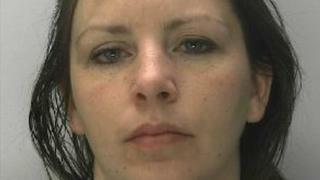 A woman who stabbed her partner to death has been jailed for nine years. Dee Lawrence, 32, of Columbia Close, Gloucester had been charged with the murder of Jack Delany at her home in April last year. Lawrence denied the charge, but in court admitted that she stabbed Mr Delany, claiming that it was in self defence. Following a retrial at Bristol Crown Court, Lawrence was acquitted of murder, but convicted of manslaughter. Det Insp Gemma Davies of Gloucestershire Police said: "I am pleased that as we approach the anniversary of Jack's death that justice has been done." Image caption Jack Delany's family described him as "a much loved son, brother and father"
In a statement, Mr Delany's family paid tribute to "a much loved son, brother and father". "The past 12 months since Jack died, aged just 25, have been both harrowing and uncertain. "It is important to us to stress that we extended our hospitality to Ms Lawrence in an attempt to support Jack in his relationship with her; sadly the outcome is Jack is no longer with us."